The HAA is greatly saddened by the passing of John Farley, a Vice President of the Association. John was not only an exceptional aviator and test pilot but a great supporter of the HAA, providing much wise counsel. John joined the Royal Aircraft Establishment, Farnborough, as a student apprentice in 1950. During his time at the RAE he flew as a Flight Test Observer on various programmes and so got to know several of the test pilots “in a master/slave sort of way”. This made him determined to become a test pilot “when he grew up” – indeed he managed to arrange an interview with the commandant of ETPS (Group Captain Sammy Wroath) while he was still an apprentice. Sammy told him his technical background meant he was just the sort of young chap they liked to have at the school but that he would have to go away and learn to fly first. Therefore, at the end of his apprenticeship, John joined the RAF for pilot training. After a first tour on Hunters in RAF Germany, he was posted to the CFS course in 1960 and became a Jet Provost instructor at Cranwell. Half-way through this tour, he was sent to Strubby to do a Meteor twin jet conversion course before joining 22 Fixed Wing course at ETPS in 1963. During his subsequent test flying tour as a Flight Lieutenant on the Aerodynamics Research Flight at RAE Bedford, he was lucky enough to fly all the UK research aircraft then flying. 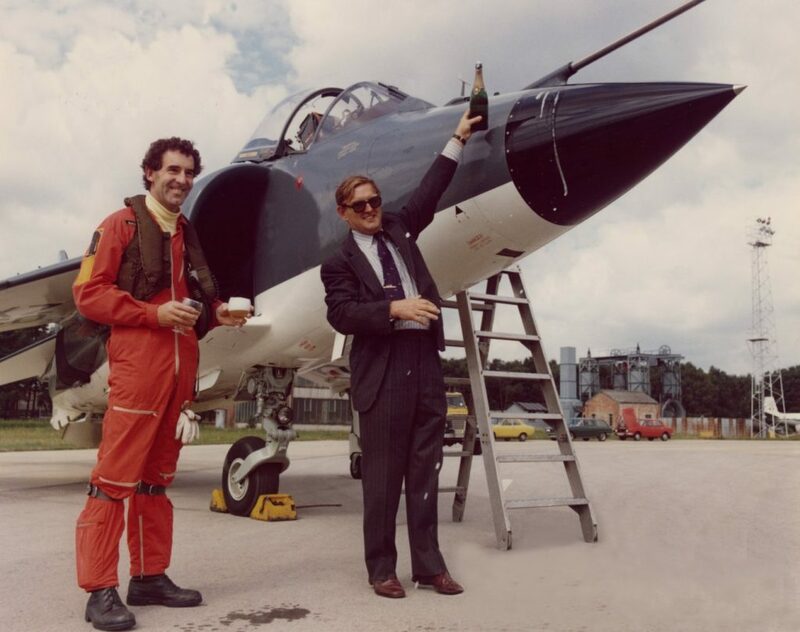 As RAE project pilot on the P1127 prototype in 1964, he started what was to become 19 years of Harrier programme test flying. He left the RAF and joined Hawkers at Dunsfold as a company test pilot in 1967, and was appointed Deputy CTP in 1971 and CTP in 1978. As the USMC programme developed, John spent increasing amounts of time in the US and particularly enjoyed 1982 when, during engine trials on the AV-8B, he managed over two hours of gliding in the Harrier – an aircraft not renowned for its soaring capabilities – albeit in over forty separate episodes and with zero angst thanks to the huge Edwards lake-bed below. 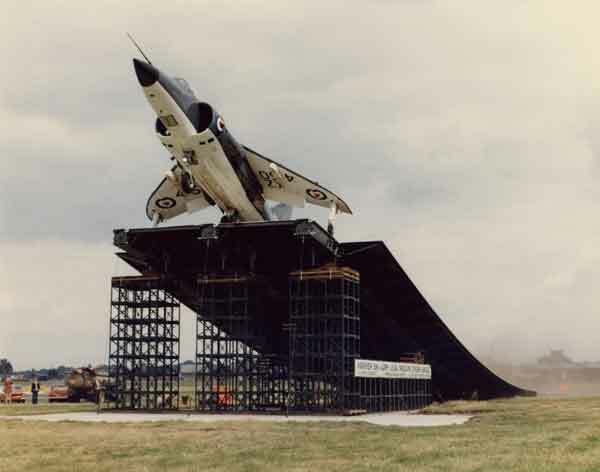 As part of John’s long association with the Harrier, he was a major proponent of the “ski jump” to enable Sea Harriers to launch safely in a wider range of conditions , requiring less over deck wind and thus reducing the engine power needed for the carrier . The trials at RAE Bedford proved the concept but also identified the need to strengthen the undercarriage. John’ s skill in the Harrier led to his signature climb from the hover, where he used the reaction controls to raise the nose to around 60 degrees whilst maintaining the hover by adjusting the nozzle angle . Then by applying max power, he would simply climb away. The instrumentation did not assist this but was accomplished by John’s amazing affinity with the aircraft. Naturally service pilots were not permitted to attempt this feat! John has flown over 80 different types and, in 1990, he became the first western test pilot to fly the Russian Mig-29. He retired from test flying in 1996 but continued to consult on flight test programmes, was a visiting lecturer at several universities and ran courses to encourage 16-18 year olds to join the aerospace business. Wally Epton, HAA Chairman commented “John Farley’s contribution as an active member of the HAA since its early inception and his role as a Council member in this millennium was highly appreciated and respected by the Association. An amusing incident took place when Council decided to invite John to become a Vice-President of the Association in recognition of his standing as an historic aviation pilot and test pilot. At a Council meeting in 2007 I asked the late Peter Thorn if he would personally issue the invitation to John Farley to become a Vice-President. Shortly afterwards I received a very nice letter from John Fairey saying he was delighted and honoured to accept the invitation extended by Peter Thorn to become a Vice-President of the Association. Peter at that time was very hard of hearing and had misunderstood my request to invite John Farley for an invitation to John Fairey. The embarrassment was quickly overcome by making both Johns Vice-Presidents at the same time, and so the HAA got two excellent VP’s for the price of one! Both, in their individual ways, contributed to the life and soul of the HAA. John Farley particularly was enthusiastic about piloting skills both in the initial transition training to historic aircraft and in the continuity training requirements. He was also wholly supportive in the same way that the late Duncan Simpson was, of the community undertaking responsibility for the safety and oversight of historic aircraft maintenance and flying. 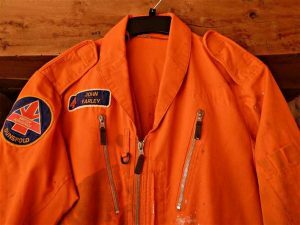 John Farley often commended us for our pursuit of SAM and a delegation from the CAA, and it is regrettable that he has not lived to perhaps see that happen. John maintained strong links with the lighter side of flying not only with the HAA but with regular talks and articles for the General Aviation sector. His book “ A View from the Hover” contains many pages of advice on how to maintain and develop flying skills for the average PPL. John will be greatly missed by his many friends in the HAA and the wider flying community.